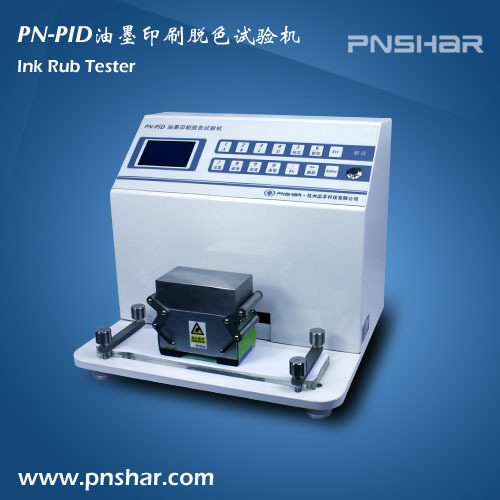 PN-PID ink abrasion resistance tester is used to test the abrasion resistance level of printing ink layer, PS board sensitization layer and relative coatings of the products. It can effectively analyze the abrasion resistance ability, adhesion force, falling of ink layer, ink decoloring, printing ability of PS board and coating hardness through performing the dry ink test, wet ink test, decoloring changes test, paper blurred test and special abrasion test. Printing ink layer, PS board sensitization layer, Relative coatings. Micro-computerized, dynamic display on blue LCD screen and membrane-moving operation panel. Inputting the testing parameters by pressing the keys and memory function after power supply cuts off. Carrying out national standard and in accordance with international standard. Controlling and analyzing the problem of bad abrasion resistance ability and easy-falling for the ink layer of the printing products.